This includes a pair of tools, used in the installation for the Biocubes and Nanocubes. 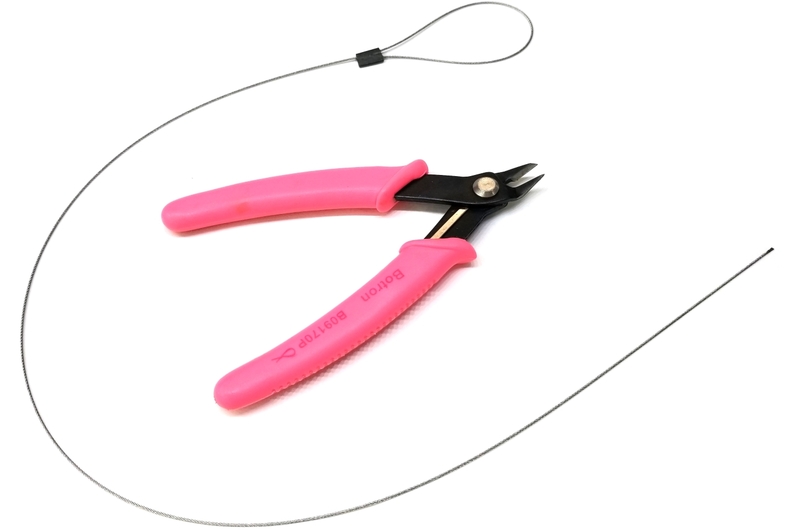 - 1 set of wire snippers - used to cut plastic bits. - 1 plastic saw - used to cut fan rib vents, or any other thick pieces of plastic where the snippers won't fit. The snippers work best when cutting away small bits of plastic at a time. If it doesn't cut easily, then you are taking too much off at a time. With a little patience, these will soon become your favorite tool! The plastic saw is an excellent tool for cutting out large amounts of plastic. To use it, just feed it around the plastic you are wanting to cut, then move the tool back and forth several times with a small amount of tension and pressure. This particular type of aircraft grade cable this is made from creates an enormous amount of friction in a very tiny space, so the wire will actually melt through the plastic. Once you get the hang of it, you will be precision cutting through large amounts plastic in no time at all. This also works great for cutting PVC pipe as well! There usually isn't a burr after the cut, but if there is, use the snipper companion tool to clean it up neatly for a professional finish. These tools are sold at cost as a service to our customers - so coupon codes don't apply.